Even as the U.S. looks to withdraw troops from Afghanistan, it’s still worth asking what could be done better. A decade after the Afghan War was launched, and with almost 3,000 coalition personnel killed and hundreds of billions spent, it’s worth asking whether the enormous effort that has gone into fighting militants has been worth it. Certainly, there’s been plenty of commentary on the issue as the U.S. outlines its plans to withdraw troops. But having spent a significant amount of time in the country studying the impact of the war effort – and the different roles played by the countries contributing to the International Security Assistance Force (ISAF) – I can only say the answer is mixed. On the one hand, my experience suggests that the coalition forces have undoubtedly been able to make a difference in some areas, with improved conditions especially in urban areas; some local populations have even started to support international forces. On the other, Afghanistan is a country where women are still killed when unable to give birth to male children, schools are burned, people are starving, and insecurity persists. And one can reasonably question whether an international coalition can really improve any of that – or if the profound lack of cultural understanding isn’t making things even worse. Back in 2008, a young Afghan woman I was sipping tea with at a compound in Herat told me that she didn’t believe it would ever be possible to make Afghanistan secure. The international force has made a difference in some respects, but has been useless in others she suggested. And whatever path is chosen for the future, it will have to include a transition period, a negotiated agreement and Afghan ownership. But before we reach that point, it’s still also worth looking at what could have been done better, and what this teaches us moving forward. The lack of coordination among contributing troops has been a problem since ISAF expanded to cover the entire country in 2006, yet it’s a problem that has been largely overlooked. When French soldiers took over the Surobi Valley near Kabul from the Italians in the summer 2008, they suffered a deadly attack a few weeks later that ultimately killed 10 soldiers. Why? Some argued that the difference was that while the French conducted more patrolling activities, Italian forces had been focusing more on humanitarian work. 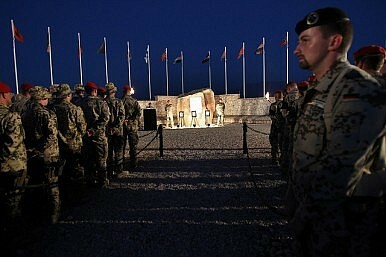 (The Times also reported that Italian soldiers were bribing the Taliban). Of course, with about 50 nations contributing to the NATO mission, effective coordination isn’t easy. Some armies are from NATO nations like the U.S. and Canada, while others are from non-NATO countries including Sweden, Mongolia and the United Arab Emirates. Complicating matters further is the fact that some armies operate with a substantial number of constraints on the use of force, especially German and Italian forces. In addition, while some contributing nations have well-funded (and in some cases well-paid) forces, such as the U.S. and Norway, others, such as Mongolia and Belarus, are much less well funded. All this means that although these various forces are deployed in the same country, with the same objective of stabilizing Afghanistan and supporting the elected government, they have profoundly different means, capabilities, rules of engagement and cultures. The reality is that aside from the benefits of cost-sharing, armed forces rarely see concrete advantages to working with other militaries. “It’s more of a burden than an opportunity,” one U.S. Marines colonel told me recently. Moving forward, there are three problems that seem particularly urgent. First, despite small adjustments, the current ISAF force laydown looks very similar to the one in 2006, when the extension of ISAF forces to the entire country was completed. While the security environment has changed profoundly since then, contributing countries have remained largely in charge of the same areas, handed down between units from the same country. In other words, there’s no coordination between armies to match the strengths or weaknesses of their units to regional needs. Time and again, combat-intensive units have been sent where soldiers are supposed to do humanitarian delivery duties, while logistics units are sent into more intense combat areas. And even when regions are handed over from one army to another, the switch isn’t always coordinated from one commanding unit to another, with dramatic consequences. A second problem area tied to coordination is how small companies from different countries are deployed under the “operational control” of a larger unit. These small units, though, are often only left responsible for minor duties. “Would a US commander ever send a Macedonian unit to do satellite patrolling in support of his soldiers? Probably not, unless he or she knew they are very good at it,” a U.S. Army colonel told me. Finally, there’s the problem of coordinating the U.S. operation Enduring Freedom with ISAF’s work, despite the unified chain of command. Coordination challenges hinder the overall mission’s success, creating inconsistencies and imbalances that the hostile parties take advantage of. The obvious remedy would be to ensure that the appropriate armies and units were deployed as necessary. But achieving this requires a few things: 1) Institutionalizing procedures to allow different agencies to understand who is working near them both across services and across national armies; 2) Creating, at the NATO level at least, an objective database of what each unit is realistically going to be able to achieve as well as greater self-reflection over what a unit is really able to achieve; 3) Encouraging political leaders to adapt to the changing security situation, while also listening more carefully to their armies’ requests. As long as coalition troops are still in Afghanistan, military leaders owe it to their own countries, and to the people of Afghanistan, to make their mission as effective as possible. There’s still time for some adjustments to make a difference. Chiara Ruffa is a research fellow at Harvard Kennedy School’s Belfer Center for Science and International Affairs. She has conducted extensive ethnographic research in Western and Northern Afghanistan and in Kabul embedded with several different European armies. She has also been conducting observation with several NGOs, traveling and following their work throughout the entire country.